Strapped in and ready to make noise, Delmont is signaling either “Go for it!” or “Call me!” I’m not up on such things. I was recently given a very special opportunity in the form of what’s called a sand rail, and I took it! 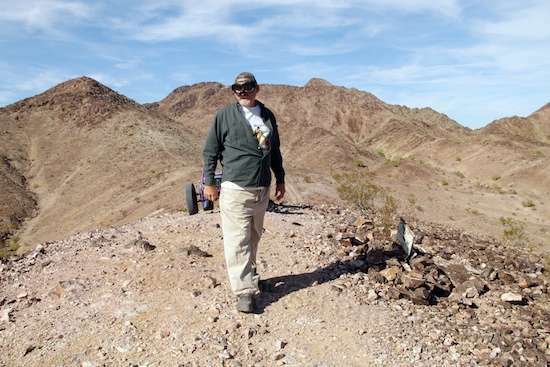 Delmont Day, a long-time Strolling Amok reader (“Papa”), invited me to tour the BLM land around Quartzsite with him. 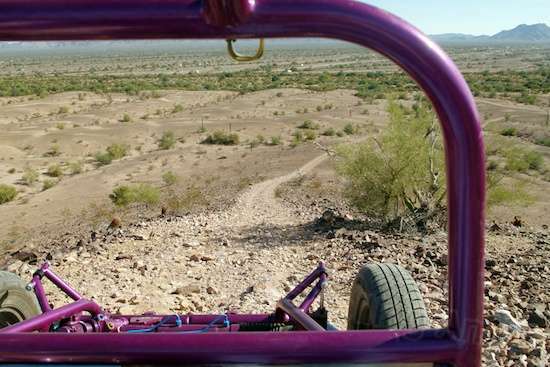 Long a fan of all things Volkswagen, Delmont had picked up his sand rail last Fall in order to be able to enjoy the extensive off-road opportunities in the Quartzsite, Arizona area. The start of the run was the deep sand track I tackled on my e-bike, but the rail’s big tires made it float over easily. And what a sand rail it is! 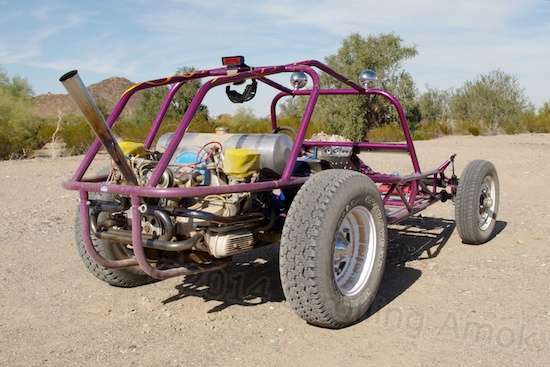 Sand rails are similar to what most folks would call dune buggies, but they have the familiar shortened VW Bug floorpan/chassis replaced with a tube chassis made up from, well, steel tubes. That change makes for a much, much stronger, stiffer, and safer platform for charging over uneven ground. While many VW Beetle sedans of the period began with a 36 horsepower air-cooled 4-cylinder, Delmont’s particular rail fell into his hands with a highly modified version which, in such a lightweight vehicle, can make for some serious excitement when you stomp the go-pedal. Stock VW’s produced all their power at low engine speeds, while this one goes into full song at high RPM. In short, it’s a racing-class rail that still uses the original VW suspension. Even easy trails like this are exhilarating, in their own way. You can cover miles without any effort, and the scenery is great! I was a bit taken aback when he nonchalantly mentioned that he had managed to slow-roll it, bottoms-up, the day before while giving someone else a ride. 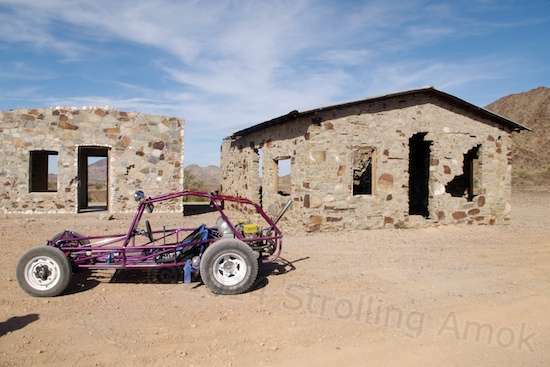 “Scratched some paint,” he told me, “But nothing was damaged.” That roll was a result of its somewhat narrow tires digging into a turn on the deep, soft gravel in Quartzsite’s main wash. See, you have to keep moving in that stuff, or the tires will sink in and try to dig their way to China. 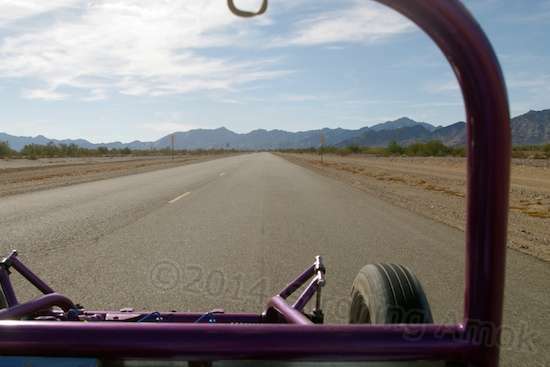 With all of the motor’s power being lumped into the top end, it’s happiest at speed. If it rolls over, you simply unbuckle your five-point harness, unceremoniously flop onto the ground, and roll it back upright. Then climb back in, start it back up, and go. We paused to examine the downslope of one hilltop, as Delmont does his Master of His Domain pose while taking in the vista ahead. Now, I wouldn’t mind rolling over in such a lightweight contraption, but my body probably would. Sustained G-forces or an elevated heart rate have proven to be problems in the past, and I strongly suspected that inversion would also be on the “Don’t Do That” list. Non-optimal things happen when the situation demands four quarts a minute and your blown pumper can only peak at two. So I cautioned Delmont that he would have relatively fragile cargo, and apparently scared the crap out of him in the process. Afraid to even goose the throttle, he gave me the smoothest Old Codger Tour he could manage. I found it surprising that, even with all of the bottom-end torque gone from the race engine and it popping unhappily through the carb, it still managed to push the lightweight car over any place that traction was available. 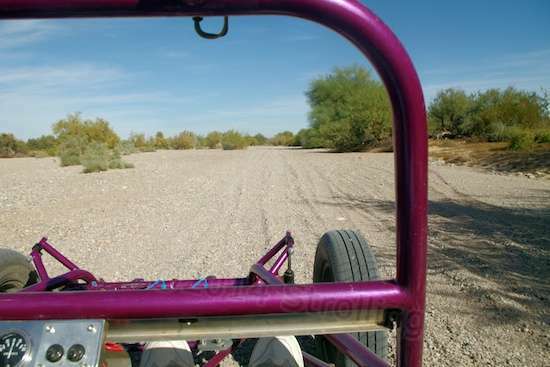 What the sand rail sees, it conquers. Two things are necessary to wear in a vehicle like this, and preferably three. 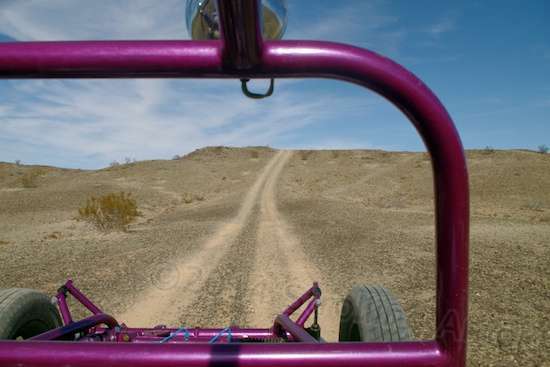 Those open wheels throw a hell of a lot of dust, which absolutely requires basic eye protection. A decent breathing mask or filter wouldn’t be bad either. It’s one of those things where you’re spitting grit for a while afterward. And on this rig, ear protection is a really good idea, since the exhaust is wide open through an upright trumpet exhaust pipe. I wore decent shooter’s earmuffs, and was surprised at just how well the engine sound came through them! Having so recently acquired the car, Delmont naturally has plans to fit a SuperTrapp or similar muffler in place. Yet for the time being, it’s relatively demure just pottering around, but ear-splitting once more ponies are urged out. My seat-of-the-pants perception was that this thing is a caged beast, caged because poor Delmont was now afraid that his passenger would expire if he laid on the throttle or even bounded over bumps. I could sense that, wide-open, this rail could fly. It doesn’t take much power to make a vehicle this light hustle, and the wretched excess of power available here must be a delight when it’s in its element. This is the descent from that same hilltop, and it’s steeper than it looks here. I had concerns that the vehicle might slide, since the loose roughness would be a challenge for my e-bike, but it was no problem. We went for an extended tour, exploring the back trails over ground that neither the Evelo e-bike nor even the ponderous Mighty Furd would be able to manage. Very steep descents and abrupt climbs out of rocky gullies, tall hills, deep sand, and bottomless gravel were all taken in stride. The hilltops frequently drop off suddenly enough that you can’t see anything but air beyond the front of the rail, so getting out to look is a real good idea. 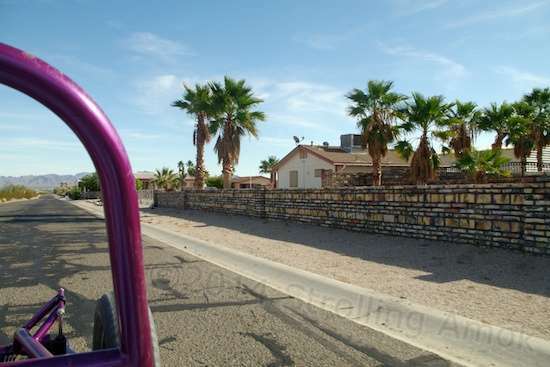 Part of the return route involved a short section of paved road, which was its own little thrill, owing to the fact that although the rail is licensed, it is not anywhere close to being street legal. Ever the humorist-wannabe, I pointed to the oil pressure gauge which showed the needle at 40 PSI, and yelled, “Don’t speed!” It’s just as well that the engine burble drowned out my attempt. Taking it all in was a frequent thing. In all, it was an afternoon of filthy fun for me, and the first time I’ve ever ridden in a vehicle of this type. I’ve owned a couple of early-60s Beetles (and enjoyed them), and the difference that the decreased weight makes really stood out. 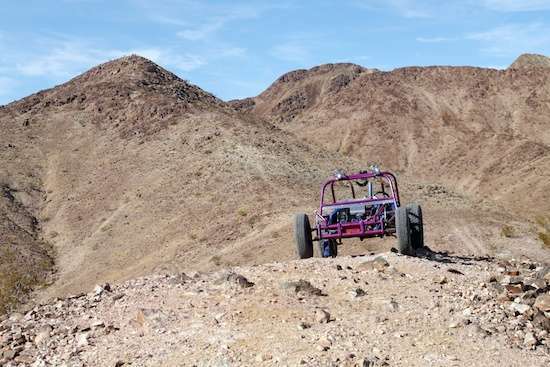 First gear becomes a seldom-used crawler gear, and second allows a much better range of speed without bogging down much when the challenges come. 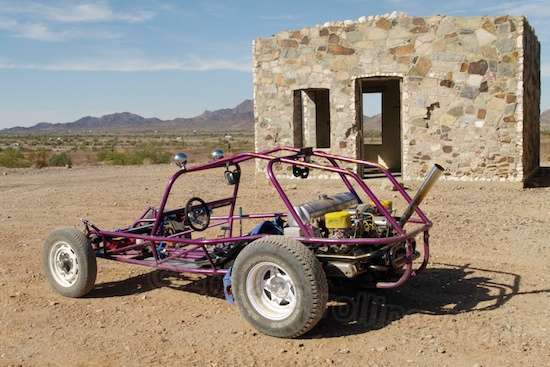 Delmont’s sand rail is a great way to fulfill a true gearhead’s need for speed. Thanks, Del! Delmont said that an artist used to live here, and the building to the left includes some type of rainwater catch system in its roof. Perhaps there’s a well around, but I did not spot it. Just a glamour shot of sorts. There are much easier ways to get here, but they are less fun. Ummm, are we supposed to be here? No, not really. Just call it all-round transport. 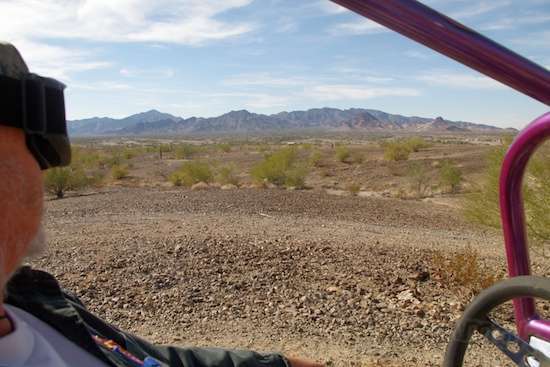 Trundling through and past an isolated RV-oriented housing development. On tour and about to head through some twisty scrub beyond. 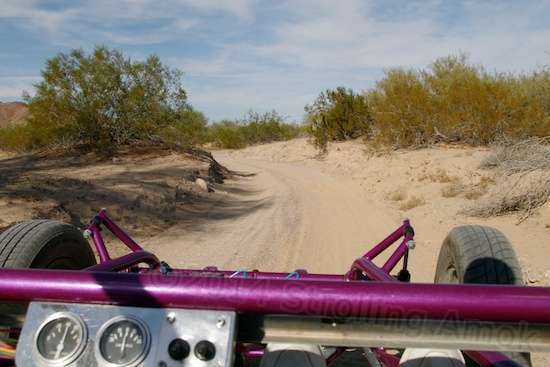 Then finishing up along Quartzsite’s main wash, where slowing down in the deep gravel can mean getting stuck. I had as much fun reading your post as I did out on our short run. 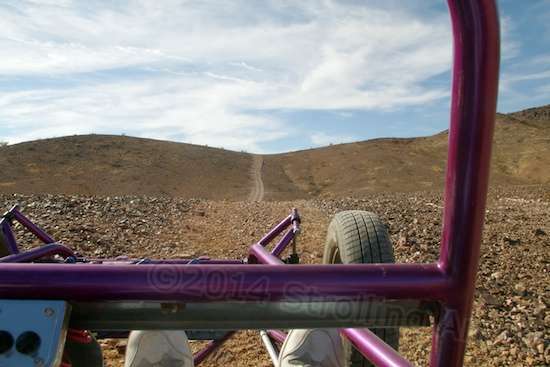 Your story makes me want to go out and buy a sandrail….oh wait….makes me want to go out and do it again. I did enjoy our time together and do hope we get the chance to spend time together again. Your description makes me wish for a rail! What great fun you both had. Oh, wish for a ride, not ownership. Doing things like wielding a toothbrush for hours once a year isn’t that much fun. I can relate. I’ve taken my jeep mudding more than a few times. Oh Man – that brings back memories! 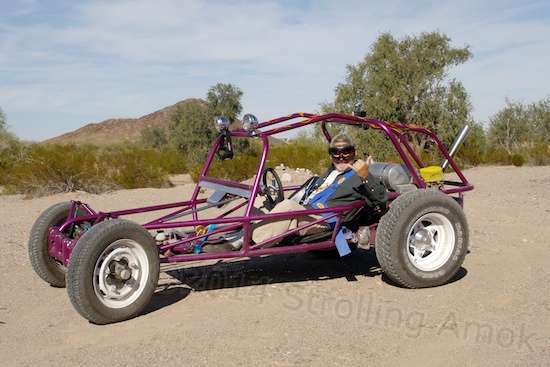 One of my step-brothers had a Myers Manx dunebuggy. We used to bomb around in the woods here in Massachusetts and boy was that fun! Never owned an air-cooled veedub, myself (a variety of Golfs and Sciroccos, though), but all 3 of my step-brothers, my younger brother and my step-dad all had a series of them over the years. One just sold his ’69 Westie van after 3o years of ownership. Thanks for commenting, David. I particularly admire the Manx, and they are now rare enough that I don’t think I’ve ever seen the real thing in person, just the original review in Car & Driver back in the late sixties, I think. I don’t much care for the many clones made by competitors afterward. My old Beetles were always ailing in one way or another, but never actually quit or refused to start. And the body integrity stayed amazing.